Finding Neverland has flown into the Providence Performing Arts Center, and you don’t want to be left behind! I admit I love Peter Pan; it was one of my favorites growing up, and I’ve always found JM Barrie a fascinating person to study. Of course, I love the movie, so I went into this show assuming I would like it; however, I was ill prepared for how much I would like it, and ill prepared for the number of tissues I needed! I loved this from the very moment the curtain went up. It was one of those occasions at the theater where the look on my son’s face will be ingrained in my mind forever. From the very first song, “Welcome to London,” the spectacle was set, and he was hooked. (And let’s be honest: Anything that can hook a very active 9-year-old boy is going to be something special!) It has that feel of an older musical; think of the first musical you fell in love with, and that’s what you have here. The story is the fictional story behind the story. 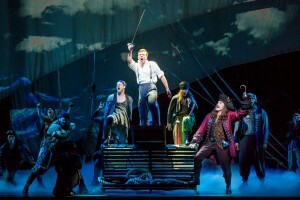 JM Barrie was inspired to write Peter Pan thanks to befriending the Davies family, and although the script plays with a few factual details, James Graham’s book is simply delightful with the right mix of comedy and heart, with Gary Barlow and Eliot Kennedy’s music and lyrics tying everything together to make this one magical night of theater. Mia Michaels’ choreography brings the feel of every musical you ever fell in love with. Billy Harrigan Tighe plays JM Barrie, and what a performance! His voice was made for this show, and when he sang “Stronger,” it was difficult to stay seated. Playing Sylvia Llewelyn Davies is the captivating Lael Van Keuren, and when she sang “Sylvia’s Lullaby,” I had chills. Joining these seasoned actors are four soon-to-be-stars in their own right. Playing the four Davies boys, George, Peter, Jack and Michael, were Colin Wheeler, Connor Casey, Wyatt Cirbus and Tyler Hennessy, respectively. All four boys were exceptionally talented; Casey held his own onstage with some of the play’s more serious moments, and especially in the number “When Your Feet Don’t Touch the Ground.” Wheeler, Cirbus and Hennessy’s comedic timing was not only spot-on, but lacked the over-the-top characteristic that some child actors find themselves trapped in. These boys were just fantastic. And I would be in trouble if I didn’t mention there’s a real dog in the show, who was clearly a crowd-pleaser! There were so many additional lovely moments from “The World is Upside Down” and “Play,” two of the bigger company numbers. And “Circus of Your Mind” is worth the trip to Neverland as Barrie’s world comes down in a captivatingly choreographed number. Of course that’s all well and good, but here’s something interesting that you won’t see unfolding onstage; in the spirit of JM Barrie’s desire to help children, each ticket sold from this show has the potential of helping out Adoption Rhode Island. Five dollars from each ticket sold will be donated to the organization in honor of NBC 10’s Tuesday’s Child. At checkout or at the box office, use the code NBC10. Considering that Barrie himself ensured that the rights to his work would benefit a children’s hospital in London, it is only fitting that Finding Neverland assists the communities it visits. I truly cannot wait to see this show again. I laughed, I cried, I danced in my seat a little, and above all, I was transported back to the days I first discovered Peter. Of course, I’m biased. I feel that all great literature can transport you, and seeing theater certainly does that; however, remember I didn’t see this alone. I brought my son, an active kid who spends his time playing hockey and video games, Star Wars and Marvel. He can be antsy at some musicals. And my junior reviewer said, “You should go to Finding Neverland because it’s a good show. My favorite part is the last scene of Act One.” He was captivated from beginning to end. After being asked a barrage of questions about Barrie’s life, and what my favorite parts were, I know that this is a show he won’t forget. And being able to share that experience is truly where the magic of theater lies. Finding Neverland will be at PPAC until December 3. Tickets can be purchased online at ppacri.org or 401-421-2787. When ordering tickets, do not forget to use code NBC10 for Adoption Rhode Island.